Using the transport scenario, students will design, program, build, and navigate their customized Unmanned Aerial System (UAS) to deliver packages to customers quickly and cost effectively in a scaled indoor replica of the Downtown Dayton area. Package delivery will be scaled accordingly to around 125 grams (4.4 ounces). Reports indicate that the FAA is working to have suitable regulation in place for civil unmanned aircraft systems (UAS) by 2015. The lift on restrictions would deliver an opportunity to rush package delivery and other commercial use. Currently, mail and transport services are working to perfect UAS package delivery (less than 5 lbs. or 2.3 kg) within a 10 mile (about 16.1 km) radius in 30 minutes or less. The Association for Unmanned Vehicle Systems International (AUVSI), projects the industry will create 100,000 jobs and generate $82 billion in economic activity in the decade after the aircraft are allowed in general airspace. With growth in commercialization use, a significant number of manufacturing positions will also be created, which in turn, will flourish secondary markets such as electronics, software, composites, and subsystems support. 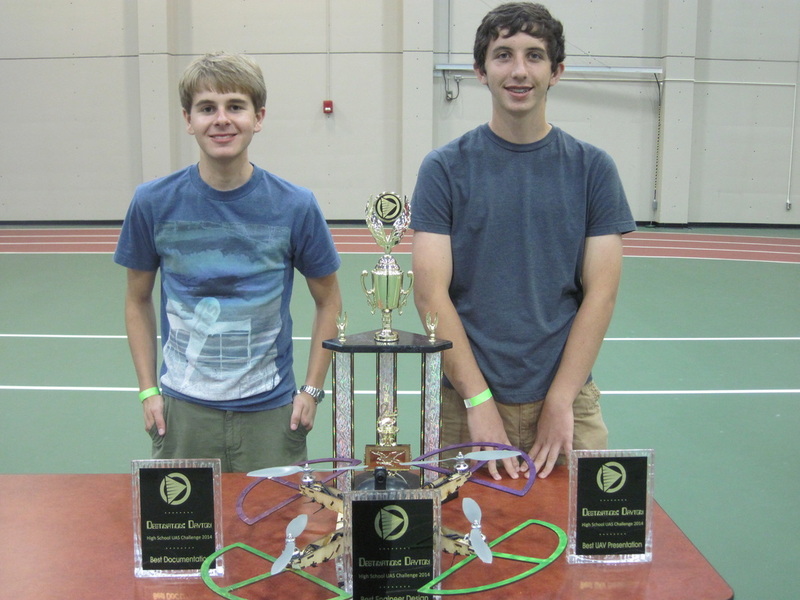 Milford High School competed in the Destination Dayton UAS Challenge in August. Justin and Zach worked through the summer to design, build, and test a quadcopter.